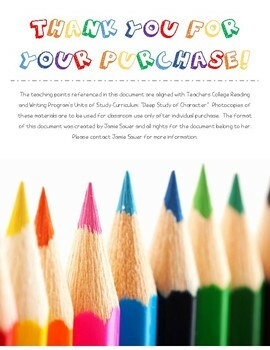 Is your school using the Teachers College Reading and Writing Program's Units of Study? 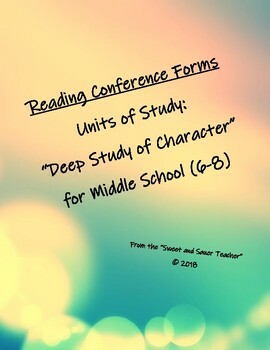 Are you looking for a conference form to track your 6th, 7th, or 8th grade students' acquisition with the teaching points from the "Deep Study of Character" unit in their independent reading books? Then this download is for you! 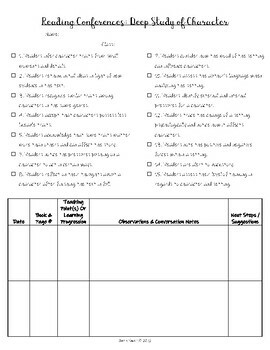 With the teaching points listed in a checklist format at the top of the document (with corresponding lesson numbers for easy reference), you can conduct more effective conferences and have documentation of your students' skills and next steps to move them forward all in one place! 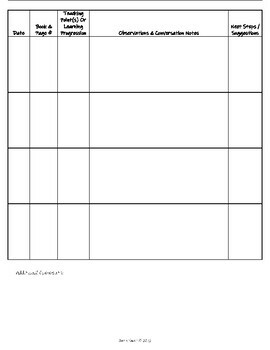 Pair copies of this document for each student in a binder with copies of the narrative learning progressions from Teachers College and watch your students soar!